March 2019: 2 Spotted Eagle seen. On the 18th Tonn left Santa Agueda on his long journey back to Estonia. On the 16th I saw an adult at the North Gate. On the 9th I saw Tonn at Santa Agueda. On the 8th I saw Tonn at Hondo VC. On the 1st I saw Tonn at Santa Agueda. February 2019: 2 Spotted Eagles seen. On the 16th I saw Tonn at Santa Agueda. On the 9th I saw an adult from the Northern OP at the North Gate. On the 5th I saw an adult at the Visitor Centre. January 2019: 2 Spotted Eagles seen. On the 12th I saw an adult from the Northern OP at the North Gate. On the 5th I saw an adult from the Northern OP at the North Gate. December 2018: 3 Spotted Eagles seen. On the 29th I saw an adult from the Northern OP at the North Gate. On the 22nd I saw an adult from the Northern OP at the North Gate. On the 15th I saw an adult from the Northern OP at the North Gate. On the 11th I saw Tonn at Santa Agueda. On the 8th I saw an adult and a juvenile from the Northern OP at the North Gate. On the 3rd I saw Tonn at Santa Agueda. November 2018: 3 Spotted Eagle seen. On the 24th I saw an adult and a juvenile from the Northern OP at the North Gate. On the 13th I saw Tonn at Santa Agueda. On the 10th I saw an adult and Tonn from the Northern OP at the North Gate. On the 3rd I saw an adult from the Northern OP at the North Gate. October 2018: 2 Spotted Eagles seen. On the 31st I saw Tonn at Santa Agueda. On the 28th I saw Tonn at Santa Agueda. On the 27th I saw an adult from the Northern OP at the North Gate. On the 20th I saw an adult from the Northern OP at the North Gate. March 2018: 3 Spotted Eagles seen. All now departed. On the 13th Tonn left Hondo for his return journey to Estonia. On the 10th I saw an adult from the Northern OP at the North Gate. On the 6th I saw an adult from the Visitor Centre. On the 3rd I saw an adult and a sub-adult from the Northern OP at the North Gate. February 2018: 3 Spotted Eagles seen. On the 26th I saw Tonn at Santa Agueda. On the 24th I saw an adult and a sub-adult from the Northern OP at the North Gate. January 2018: 2 Spotted Eagles/1 Lesser Spotted Eagle seen. On the 20th I saw an adult and Tonn from the Northern OP at the North Gate. 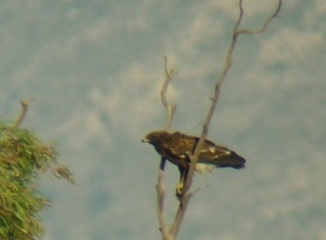 Also an adult Lesser Spotted Eagle. On the 13th I saw an adult from the Northern OP at the North Gate. 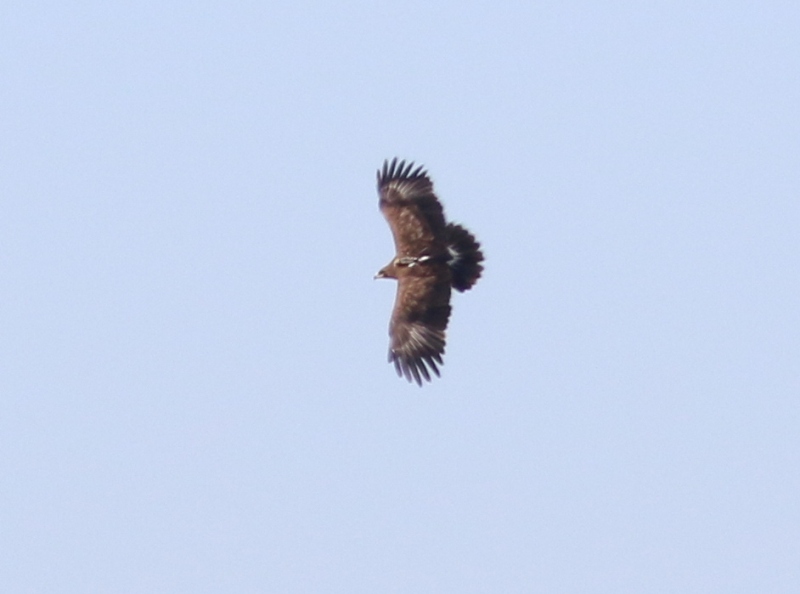 Also an adult Lesser Spotted Eagle. December 2017: 2 Spotted Eagles seen. On the 30th I saw an adult from the Northern OP at the North Gate. On the 29th I saw Tonn at Santa Agueda. The 5th finger on his left wing is missing. On the 25th I saw Tonn at Santa Agueda. On the 23rd I saw an adult from the Main OP at the North Gate. On the 17th I saw Tonn at Santa Agueda. On the 16th I saw an adult from the Main OP at the North Gate. On the 2nd I saw an adult from the Northern OP at the North Gate. On the 1st I saw an adult from the Vistabella Road. November 2017: 1 Spotted Eagle seen. On the 25th I saw an adult from the North Marsh Platform. October 2017: At least 1 Spotted Eagle seen. On the 14th I saw an adult from the North OP. On the 2nd I saw an adult from the Vistabella Road. September 2017: 1 Spotted Eagle seen. On the 21st I saw an adult near the South Gate on the Vistabella Road. April 2017: All Spotted Eagles have gone. March 2017: 2 Spotted Eagle seen. On the 25th I saw an adult (which wasn't Tonn as he has left the area) at Hondo. On the 18th I saw an adult (which may have been Tonn) at Hondo. On the 11th I saw an adult at Hondo. On the 10th I saw Tonn at Santa Agueda. On the 4th I saw an adult at Hondo. On the 2nd I saw Tonn and another adult at Santa Agueda. February 2017: 4 Spotted Eagle seen. On the 25th I saw an adult and a very strange plumaged sub-adult at Hondo. On the 22nd I saw a sub-adult from the Hondo Visitor Centre. On the 15th I saw Tonn at Santa Agueda. On the 11th I saw Tonn at Hondo. On the 7th I saw an adult at El Bosquet, Hondo. January 2017: 3 Spotted Eagles seen. On the 28th I saw an adult at Hondo. On the 21st I saw an adult and a sub-adult at Hondo. On the 14th I saw an adult at Hondo. On the 7th I saw an adult at Hondo. On the 2nd I saw Tonn at Santa Agueda. December 2016: 3 Spotted Eagles seen. On the 30th I saw Tonn at Santa Agueda. On the 27th I saw Tonn at Santa Agueda. On the 17th I saw 2 adults at Hondo neither of which was Tonn. On the 10th I saw 2 adults at Hondo neither of which was Tonn. On the 3rd I saw an adult at Hondo. November 2016: 2 Spotted Eagles seen. On the 26th I saw an adult at Hondo. On the 21st I saw Tonn at Santa Agueda. On the 19th I saw an adult at Hondo. On the 12th I saw an adult at Hondo. On the 7th I saw an adult at El Bosquet. On the 5th I saw an adult at Hondo. On the 4th I saw Tonn at Santa Agueda. October 2016: 2 Spotted Eagles seen. On the 29th I saw an adult at Hondo. On the 22nd I saw an adult at Hondo. On the 14th I saw an adult at Santa Agueda. On the 10th I saw an adult at Santa Agueda. April 2016: 1 Spotted Eagle seen. On the 1st I saw an adult from the Visitor Centre at Hondo. March 2016: At least 2 Spotted Eagles seen. On the 24th I saw an adult from the Visitor Centre at Hondo. On the 19th I saw an adult from the North OP at Hondo. On the 12th I saw an adult from the North OP at Hondo. February 2016: At least 2 Spotted Eagles seen. On the 27th I saw an adult from the North OP at Hondo. On the 22nd I saw Tonn from the La Raja OP at Hondo. On the 20th I saw an adult from the North OP at Hondo. On the 13th I saw an adult from the North OP at Hondo. On the 6th I saw an adult from the North OP at Hondo. On the 5th I saw Tonn at Santa Agueda. January 2016: At least 2 Spotted Eagles seen. On the 30th I saw an adult from the North OP at Hondo. On the 23rd I saw an adult from the North OP at Hondo. On the 16th I saw an adult from the North OP at Hondo. On the 9th I saw an adult from the North OP at Hondo. On the 2nd I saw 1 adult and Tonn from the North OP at Hondo. December 2015: At least 4 Spotted Eagles seen. On the 26th I saw 1 adult from the North OP at Hondo. On the 19th I saw 1 adult from the North OP at Hondo. 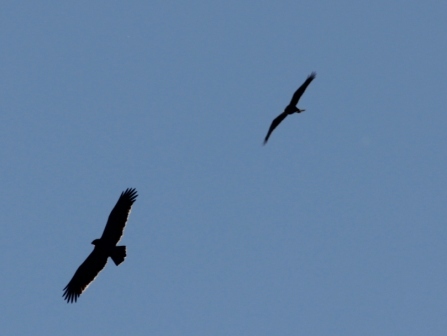 On the 12th I saw 1 adult and 1 juvenile from the North OP at Hondo. On the 6th I saw 1 adult and 1 sub-adult from the Vistabella Road. 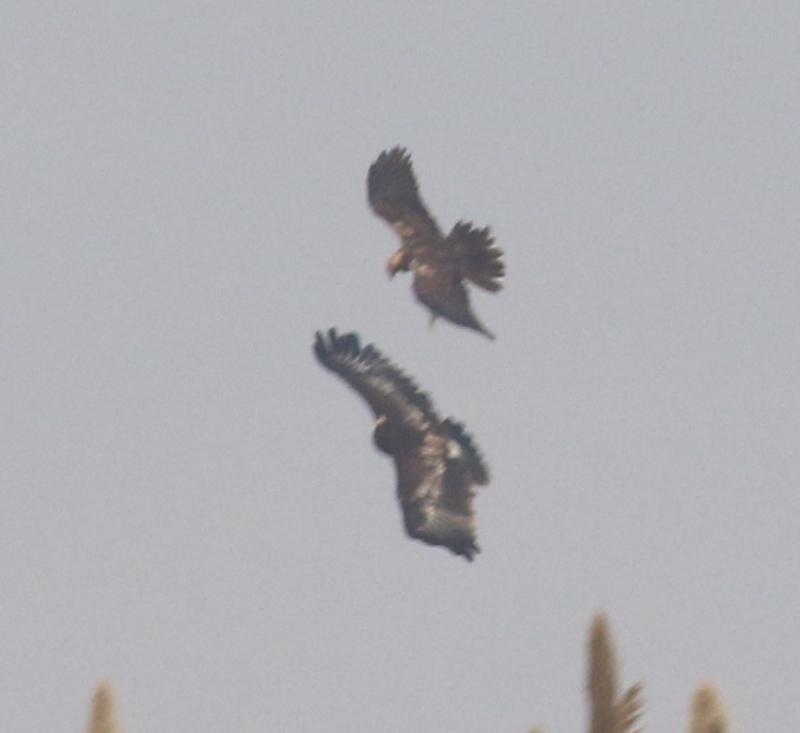 On the 5th I saw 1 adult and 1 juvenile from the North OP at Hondo. November 2015: 4 Spotted Eagles seen. On the 28th I saw 1 adult from the North OP at Hondo. On the 24th I saw Tonn at Santa Agueda. On the 21st I saw 1 adult from the North OP at Hondo. On the 20th I saw Tonn and a Sub-Adult bird at Santa Agueda. The younger bird attacked Tonn who flew off quite put out by the intrusion. On the 19th I saw Tonn at Santa Agueda. On the 14th I saw 1 adult from the North OP and 1 flying across the northern marshes at Hondo. On the 7th a group of birders saw an adult from the North OP at Hondo. 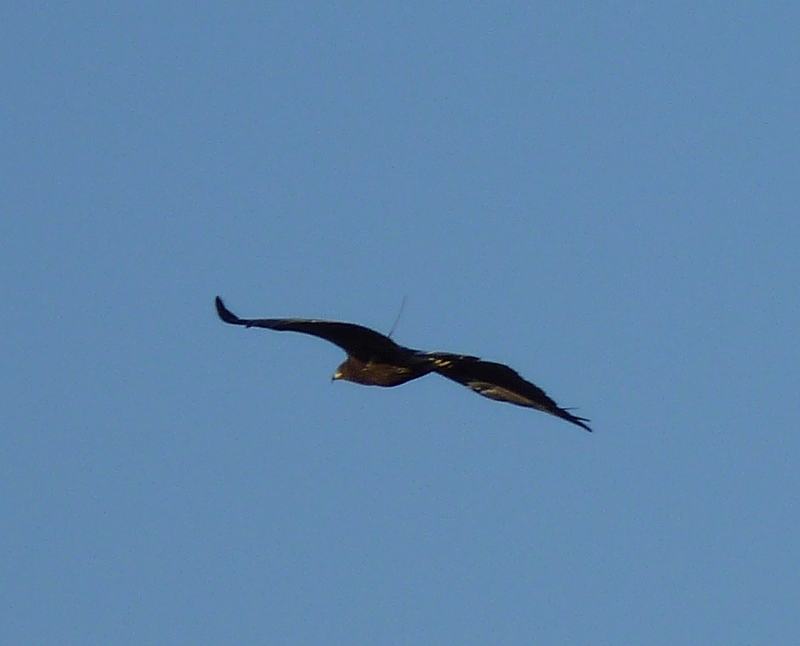 October 2015: 1 Spotted Eagle seen. On the 31st a group of birders saw an adult from the North OP at Hondo. April 2015: All birds have gone. March 2015: 2 Spotted Eagles seen. On the 21st a group of birders saw an adult from the North OP at Hondo. On the 2nd I saw Tonn (below) from the La Raja OP. February 2015: 3 Spotted Eagles seen. On the 28th a group of birders saw an adult from the North OP at Hondo. On the 27th I saw Tonn (below) from the La Raja OP. Note the box on his back which is part of the satellite gear. On the 21st a group of birders saw 2 adults from the North OP at Hondo. On the 19th I saw Tonn from the Santa Agueda OP. On the 14th a group of birders saw an adult from the North OP at Hondo. On the 9th I saw Tonn from the Santa Agueda OP. On the 6th I saw Tonn from the Santa Agueda OP. January 2015: 3 Spotted Eagles seen. On the 28th I saw an adult from the Santa Agueda OP. On the 25th I saw Tonn from the La Raja OP. On the 17th a group of birders saw an adult from the North OP at Hondo. December 2014: 6 Spotted Eagles seen. On the 27th a group of birders saw an adult from the North OP at Hondo. On the 26th I saw Tonn from the platforms at Santa Agueda. On the 20th a group of birders saw an adult and then a sub-adult which was flushed by a juvenile Bonelli's Eagle from the North OP at Hondo. On the 17th I saw Tonn from the platforms at Santa Agueda. On the 13th I saw 2 adults from the North OP at Hondo. On the 11th I saw Tonn from the platforms at Santa Agueda. On the 10th a group of birders saw Tonn from the platforms at Santa Agueda. On the 9th I saw an adult from the La Raja OP. 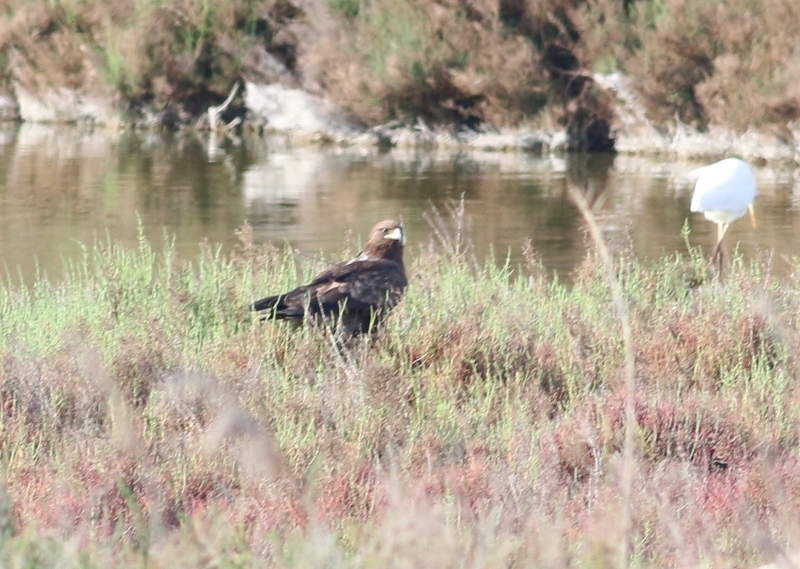 On the 7th I saw the juvenile being mobbed by a Marsh Harrier from the 1st hide on the Vistabella Road. On the 6th I saw 3 different adults at Hondo PN. On the 5th I saw Tonn from the platforms at Santa Agueda. 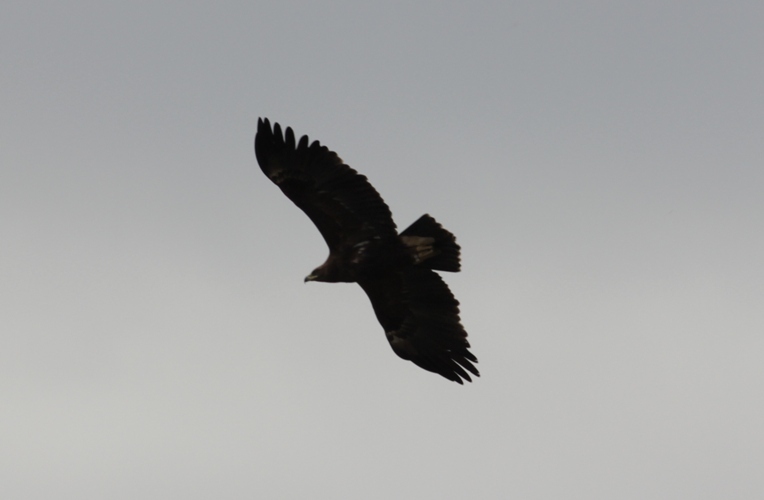 On the 4th I saw Tonn, another adult and a sub-adult from the platforms at Santa Agueda. On the 3rd a group of birders saw Tonn really well from the platforms at Santa Agueda. 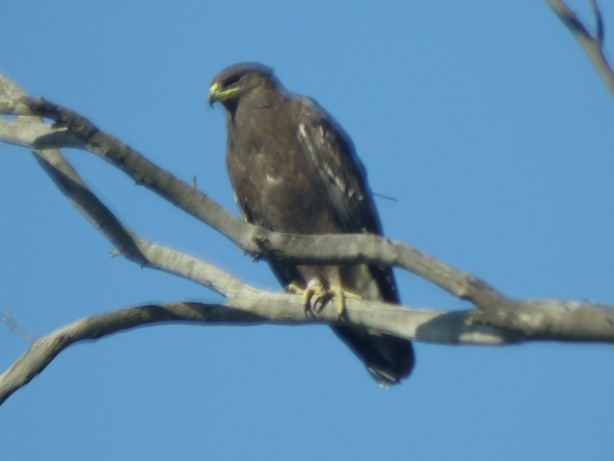 November 2014: 4 Adult Spotted Eagles (including Tonn) and a juvenile (and possibly a sub-adult) present and 1 Lesser Spotted Eagle. On the 29th a group of birders saw an adult bird from the North OP at Hondo. On the 27th I saw Tonn from the La Raja OP. He landed in a tree quite close to the small town of Catral and stayed there for at least an hour. On the 20th I saw the juvenile GSE from the 1st hide on the Vistabella Road. On the 16th I saw 3 adult GSE's at the same time along with the juvenile LSE which was sitting in a tree ignoring it's big brothers from the 1st hide on the Vistabella Road. On the 15th a good number of birders saw an adult GSE from the North OP amd another adult from the Main OP. On the 10th I saw an adult GSE from the 1st hide on the Vistabella Road. On the 8th a good number of birders had a cracking view of an adult GSE from the North OP firstly sitting in the marsh c100m from the platform and then flying off towards the palms. 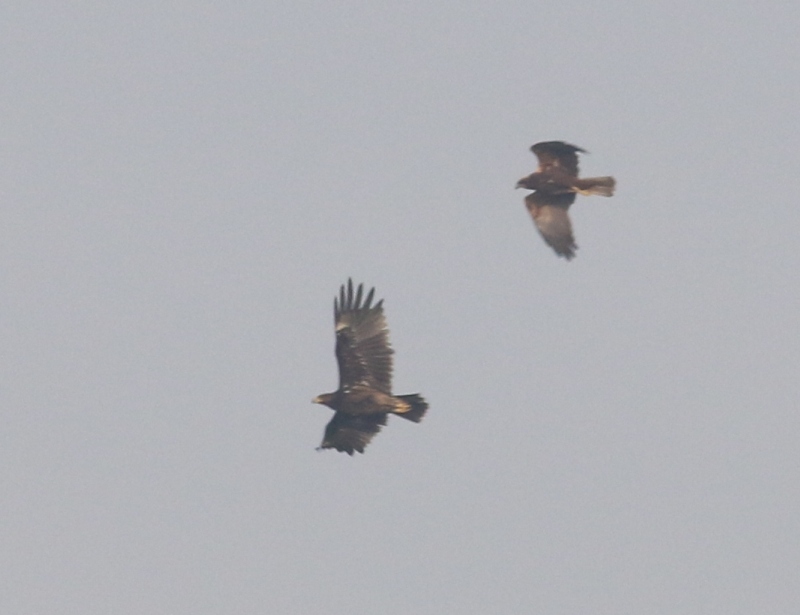 Female Marsh Harrier attacking juvenile Spotted Eagle at Hondo on 2nd November. On the 2nd I saw an adult GSE and a juvenile GSE from the 1st hide on the Vistabella Road. On the 1st a good number of birders saw an adult GSE from the North OP and a similar number of birders saw another adult GSE and a juvenile LSE from the Marsh Hide near the Main OP. On the 30th I saw the juvenile from the first hide on the Vistabella Road. 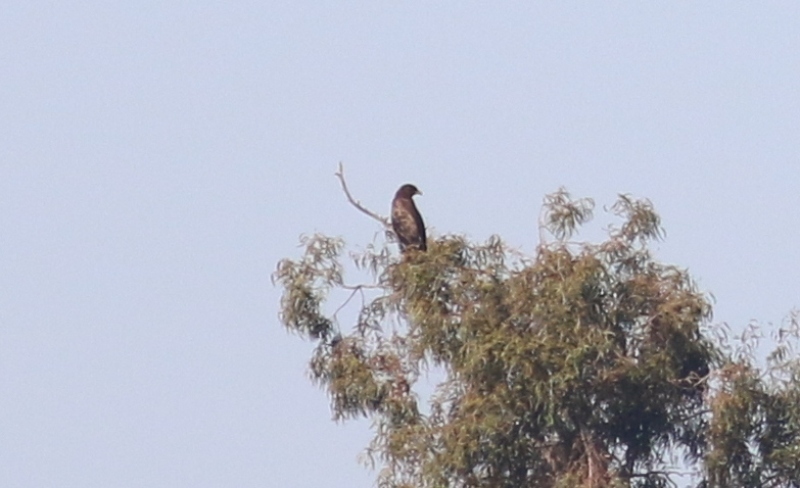 Juvenile Lesser Spotted Eagle (note double comma) at Hondo on 28th October. 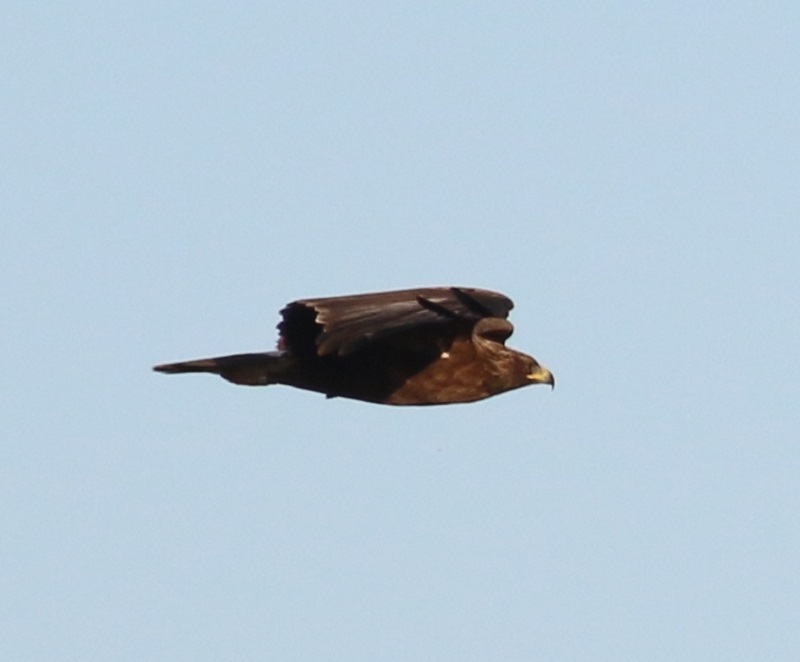 Juvenile Lesser Spotted Eagle (note smaller, slenderer bill) at Hondo on 28th October. Adult Spotted Eagle (note much heavier bill than Lesser) at Hondo on 28th October. On the 28th I saw an adult bird and a juvenile from the first hide on the Vistabella Road. 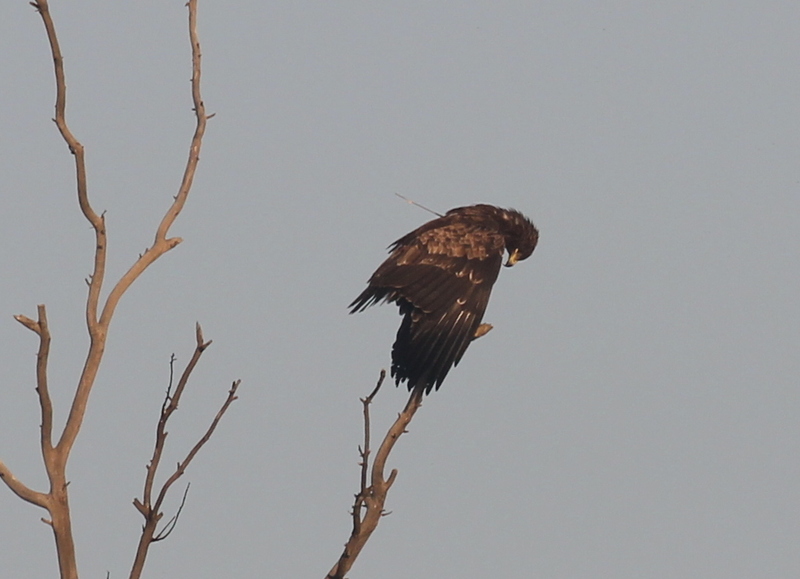 Also a juvenile Lesser Spotted Eagle. On the 27th I saw an adult bird, and a juvenile from the first hide on the Vistabella Road. On the 19th I saw an adult bird flying above my house from the La Raja OP. 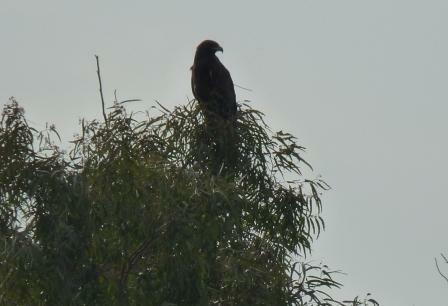 On the 13th I saw a sub-adult bird and an adult bird flying together over the eucalyptus trees at Hondo, from my house. They were both being mobbed by Marsh Harriers. On the 12th I saw a sub-adult bird in, and flying nearby, the eucalyptus trees at Hondo, from my house. It was being mobbed by Booted Eagles and Jackdaws. 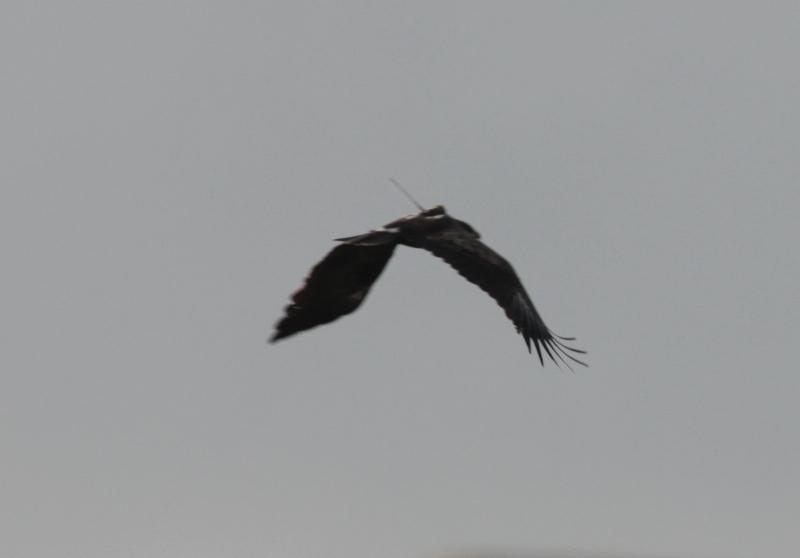 It was clearly showing the white 'V' in the base of the tail and also a few white spots on the wings. My guess is either a 3rd or 4th winter bird. Almost certainly the same one seen as yesterday. On the 11th a good number of birders saw what appeared to me to be an adult in the distance from the Main OP. Later I got an E-Mail from a reliable source that a sub-adult was seen well from the first hide on the Vistabella Road. 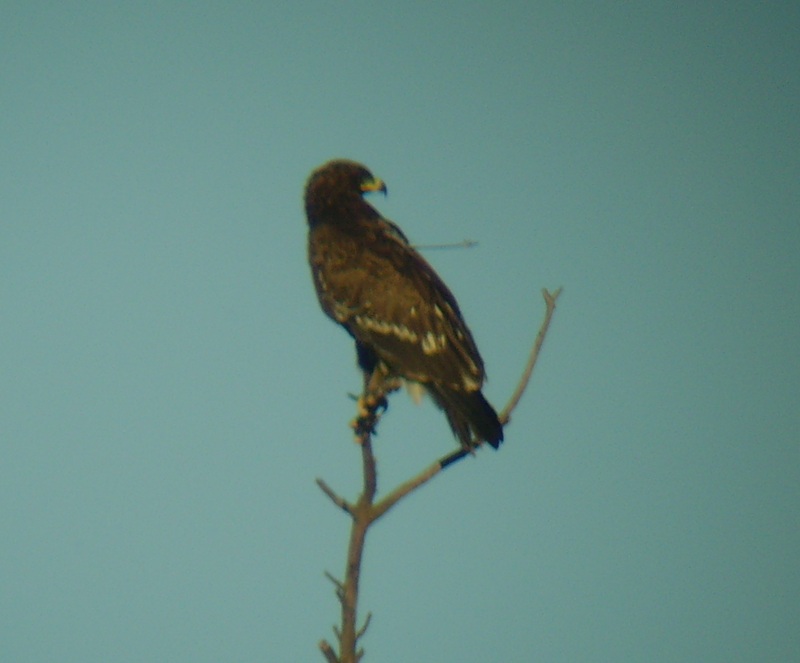 September 2014: Only 1 Spotted Eagle seen in the month. On the 10th I saw an adult on the Vistabella Road being mobbed by Jackdaws and Marsh Harriers. April 2014: All Spotted Eagles have now gone. March 2014: At least 4 birds present during the month. On the 23rd Tonn departed Hondo. Will he find a partner this summer and become a father? On the 15th I saw a Juvenile bird from the North OP and also Not Tonn from the same place. On the 11th I saw a Juvenile bird from the hide on the Vistabella Road. 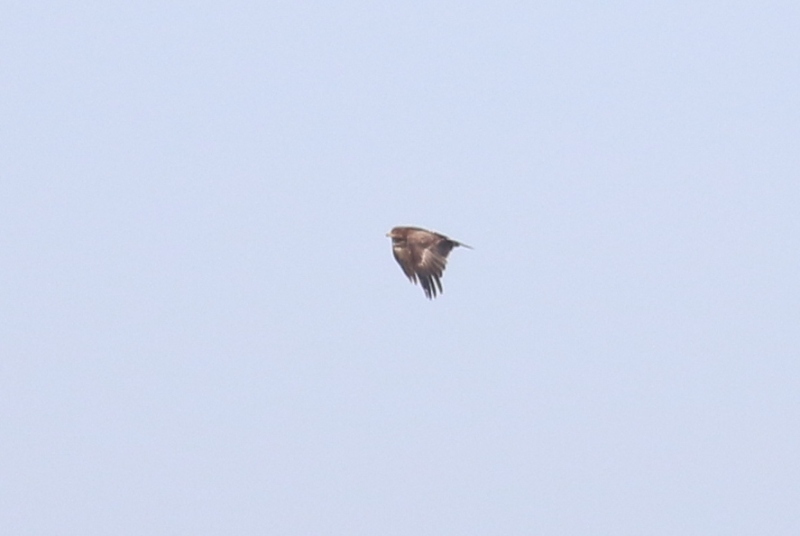 On the 10th I saw Tonn being mobbed by Marsh Harriers from the Hondo Visitor Centre boardwalk. On the 8th a group of birders saw an individual sitting in a tree from the North OP. It didn't move the whole time we were observing it but I am pretty sure it was an adult bird. However, it could have been the 'Adult' bird or either Tonn or 'Not Tonn' who are both now adults too. On the 7th I saw the sub-adult bird from the Hondo Visitor Centre boardwalk. On the 1st a group of birders saw an individual sitting in a tree from the North OP. It didn't move the whole time we were observing it and could not identify which one it was. February 2014: At least 4 birds present during the month. On the 25th I saw 'Not Tonn' from the boardwalk at the Visitor Centre. On the 22nd I saw the sub-adult bird from the North OP and the adult bird from the Main OP. On the 19th I saw the adult bird, Tonn (who now looks like an adult without any white patches on his wings or back) and the sub-adult bird from the boardwalk at the Visitor Centre. On the 15th I saw the adult bird from the North OP. On the 8th I saw 'Not Tonn' from the North OP. On the 6th I saw the sub-adult bird from the first hide on the Vistabella Road. On the 1st I saw 'Not Tonn' from the North OP sitting in a tree for the whole 3 hours. January 2014: At least 4 birds (Plus Tonn) present during the month. On the 30th I saw the adult bird from the boardwalk at the Visitor Centre. On the 29th I saw the sub-adult bird from the platforms at Santa Agueda. On the 18th a group of birders saw 2 Spotted Eagles. First, the adult, which was sat in a tree at the back of the marsh which eventually flushed to be mobbed by a Marsh Harrier, then 'Not Tonn' which was seen well by all and photographed by a few. On the 17th I saw 3 Spotted Eagles. First, the adult, which was sat in a distant tree inside the reserve, which eventually flushed when being mobbed by a Booted Eagle. 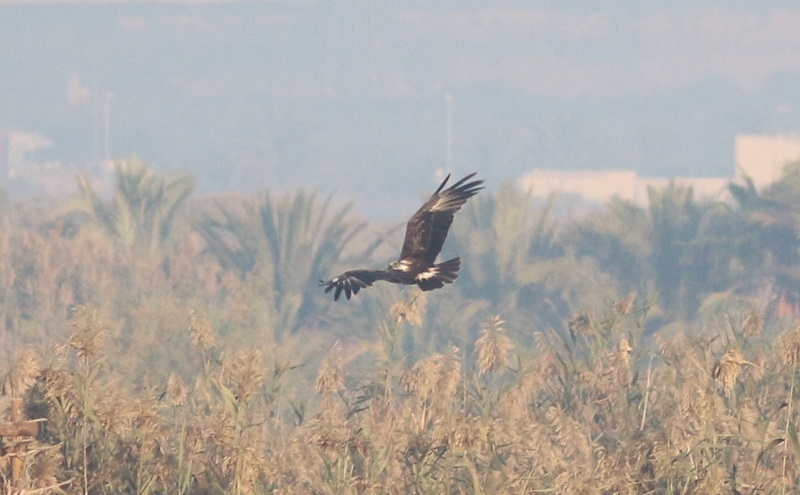 Second, the sub-adult bird being mobbed by a couple of Marsh Harriers, and finally the 1st Winter bird seen at the back of the lagoon near to the Elche - Dolores Road on the ground, having caught something. It was continually flapping about trying to catch whatever it was trying to eat giving superb views of its' very white markings. On the 15th I saw 'Not Tonn' from the Visitor Centre boardwalk. December 2013: At least 4 birds present during the month. On the 23rd I saw the 1st winter bird from my front garden area flying over Poniente Lagoon and the South Gate. On the 21st 'Not Tonn' was seen from the North OP within the reserve. A new bird was found by Pat Harrison at the Main OP. It was a 1st winter bird. A true 'Spotted' Spotted Eagle! This is the 5th individual of the winter which is the most I have ever seen at Hondo. On the 20th Tonn was seen from the OP at Santa Agueda. On the 14th the adult bird was seen from the North OP. On the 7th the adult bird was seen from the North OP. On the 4th the adult bird was seen from the Visitor Centre boardwalk. November 2013: 4 birds present during the month. On the 30th, both Not Tonn and the sub-adult were seen from the North OP. On the 28th, I cycled over to the La Raja OP from where I saw Not Tonn hunting over Poniente. On the 27th, I drove around to the Visitor Centre. I got out onto the boardwalk and started looking for birds. I saw a few Marsh Harriers 'bombing' a large bird sitting on the top of a tree somewhere behind the track between the Wigwam OP and the La Raja OP. Scoping it made me realise it was Tonn. I could clearly see the satellite antenna. However, the strange thing was, the bird had some white markings down its back. A few weeks ago, I had reported that I had seen Tonn without white markings on his back. That bird I saw really well and could see the antenna but no white. I therefore concluded that Tonn had become an adult. But today I believe I saw Tonn with white markings so what was the bird I saw a few weeks ago? 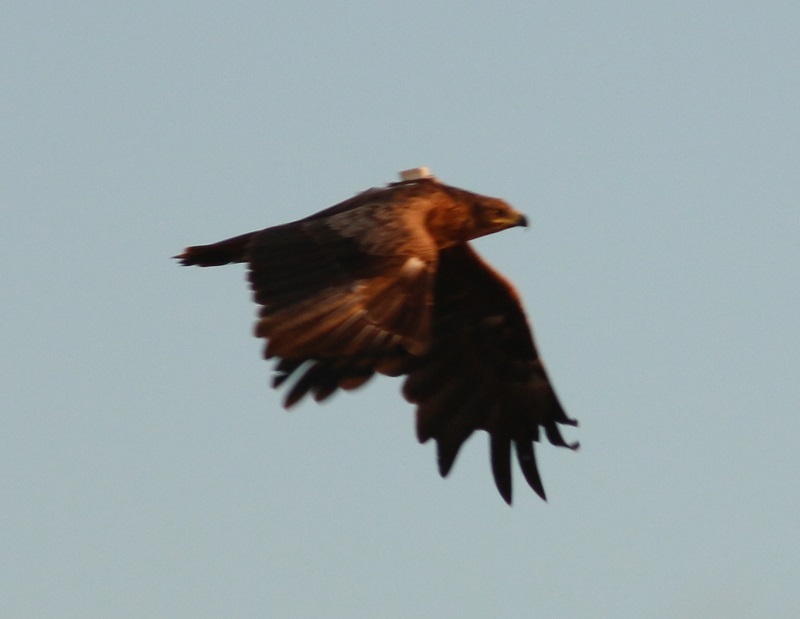 Could there be another Spotted Eagle with an antenna that is an adult. 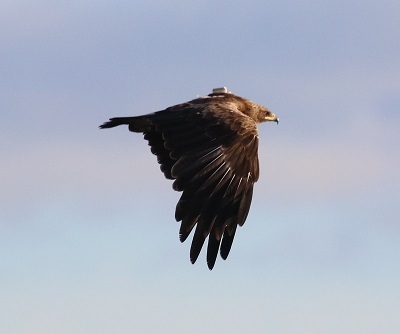 I have E-Mailed the Estonian Spotted Eagle people to find out if they are aware of an adult bird with an antenna. I await their reply. Not Tonn was seen well from the North OP on the 23rd hunting successfully over the marshes. The sub-adult bird was seen well from the boardwalk at the Visitor Centre on the 21st being mobbed by a flock of Jackdaws and some Marsh Harriers. 3 birds seen flying together at Hondo Visitor Centre area on the 17th. These 3 individuals (Tonn, Not Tonn and the adult) looked like they were either having fun or being aggressive to each other. I'm not sure which. I have seen this behaviour before. The adult bird was seen well from the North OP on 16th by a group of birders. Tonn was seen from the boardwalk at the Visitor Centre on the 15th for at least 5 minutes without once being mobbed by a single bird. The adult bird was seen well from the North OP on 9th by a group of birders. The adult bird was seen from the boardwalk at the Visitor Centre on 6th being mobbed by a flock of Jackdaws. Tonn was seen from the boardwalk at the Visitor Centre on 5th being mobbed by at least 4 Marsh Harriers. October 2013: Up to 4 birds present during the month. Tonn is present according to satellite data although hasn't been seen much. There are at least 3 more birds present, an adult which was seen on the 10th, a sub-adult, which after looking at all my pictures of Tonn through the years, I think is a 4th winter bird and was seen on the 30th and 'Not Tonn' which may or may not be the same bird as the last few years. It is in identical plumage to Tonn but does not have a satellite tag. 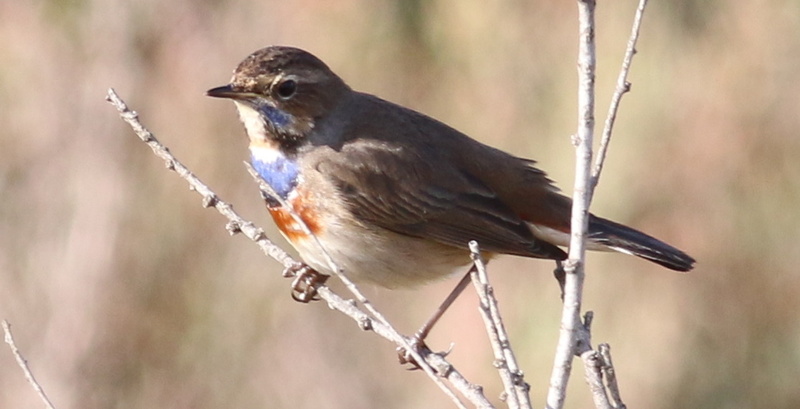 This bird was seen on the 19th, 26th and 30th. On the 30th, a sub-adult was seen being mobbed by a large flock of Jackdaws (above). On the 26th, 'Not Tonn' was seen again being mobbed by a Grey Heron. 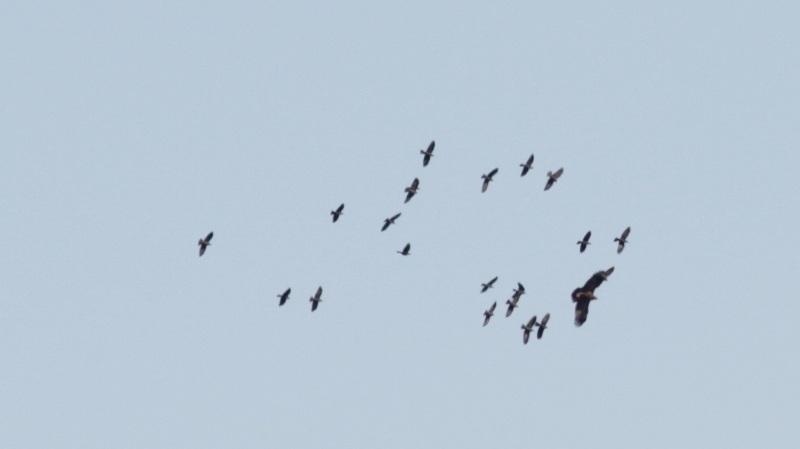 On the 19th, a large flock of birders witnessed 'Not Tonn' (above) from the North OP. It showed very well and had clearly the same plumage as Tonn. On the 10th, I saw the adult bird from the boardwalk at the Visitor Centre. It was hunting over the marshes at a distance. September 2013: Up to 3 birds present during the month. On the 25th September I went to the newly accessible hide on the Vistabella Road. 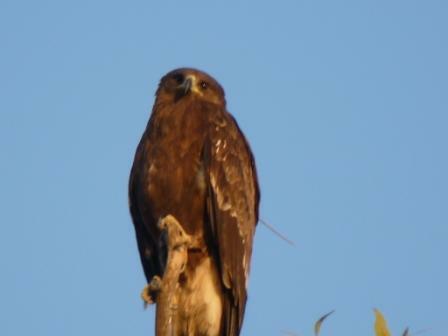 An adult bird was roosting on the tallest tree about 300m north of the South Gate. 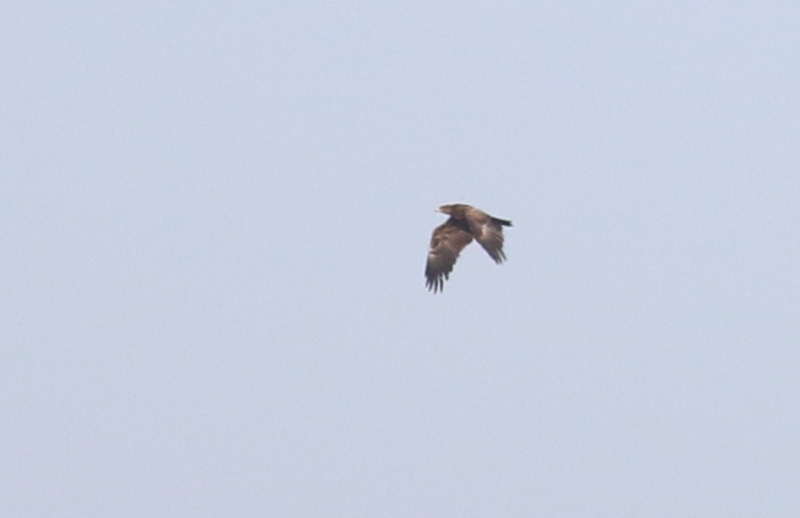 2 Booted Eagles were harrassing it and it eventually flew off. On the 18th September I drove to the North Gate to go into the reserve. I arrived at 0920 and nobody else was present. On the entrance track I noticed a very large bird sitting in the dead tree by the North Gate. Through binoculars I wasn't sure what it was, but having got out of the car and got the scope on it, I realised it was a Spotted Eagle. I took a few distant pictures of it and then walked down the track towards the bird. At about 150m distance it flew. I got a few pictures of it and when I looked at them realised it was Tonn. He is in mainly adult plumage but with a fainter white 'V' on the base of his tail, a small white patch on his back, but buffy markings (like an adult) on his primaries. On the 6th I spent a few hours on the boardwalk at the back of the Visitor Centre. I saw another very large bird hunting over the marsh and being mobbed by Jackdaws. These were 1/4 the size of the eagle. I scoped this bird for at least 3 minutes. Again, there was absolutely no sign of an antenna, but I did see some extensive white markings in the base of the tail and on the back, making it a likely sub-adult bird. This bird was seen again on the 13th hunting over the Vistabella fields. On the 5th, I went to the Visitor Centre end (where he was on the 3rd according to satellite data). I searched the whole area thoroughly and was eventually rewarded by a distant sighting of an adult bird (I believe now that this wasn't Tonn after having seen him on the 18th and he still does have some white on his body). On the 2nd he went further south to La Mata lagoon, then returned to Hondo on the 3rd. On the 1st, Tonn arrived at Hondo the earliest he has ever got back here. April 2013: All Spotted Eagles have now gone. On 3rd April I saw the adult bird fly over the North Gate, the last sighting for the winter. March 2013: At least 2 Spotted Eagles present until 27th. 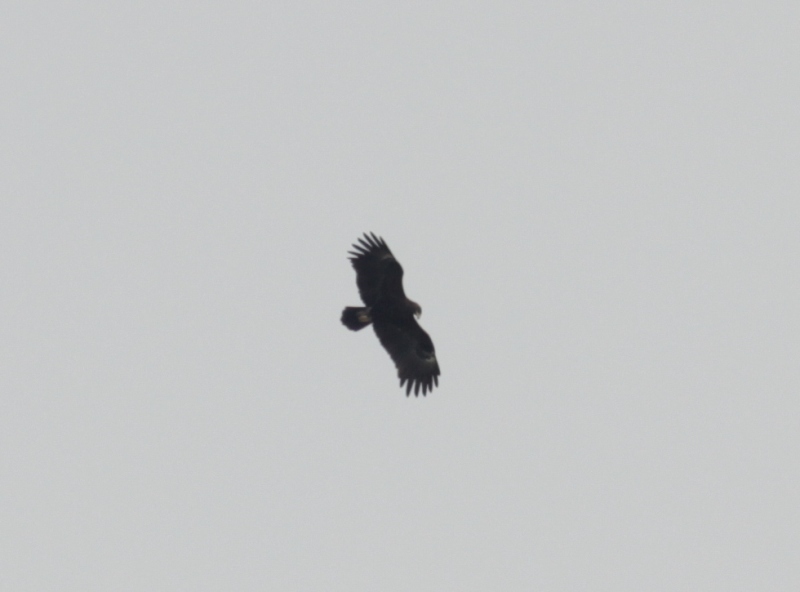 On 1st March I saw Tonn near the Visitor Centre at Hondo. On 4th,9th and 11th March I saw Tonn near the Main OP. On 12th March I saw the adult bird from the Vistabella Road. On 20th March I saw the adult flying near the rubbish tip on the boundary road. According to satellite data Tonn left Hondo around 27th March. 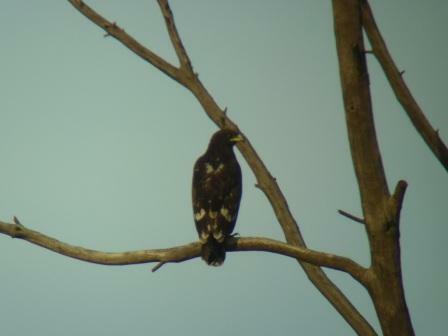 February 2013: At least 3 Spotted Eagles present. On 1st February I saw Not Tonn near the Visitor Centre at Hondo. On 4th February I saw the adult bird which flushed out of the eucalyptus trees north of the South Gate. On 9th February I saw (along with numerous other birdwatchers) Not Tonn hunting over the north end of Poniente Lagoon. On 16th, I saw the adult bird on the edge of Poniente Lagoon. 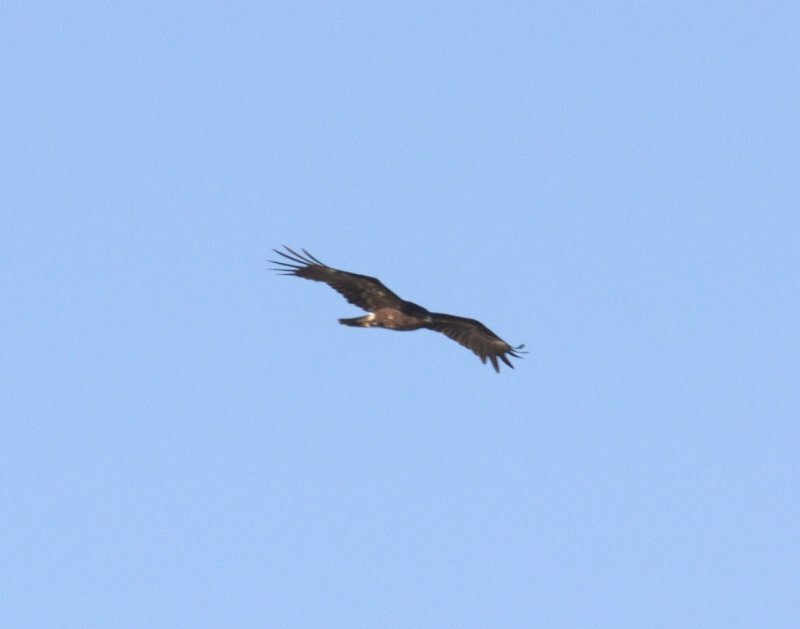 On 25th I saw Not Tonn hunting over the north end of Poniente Marsh and Tonn c400m south of the Main OP flying (in what looked like for fun) over Levante being harrassed by 2 Marsh Harriers. On 27th, a horrible cold windy day, Tonn was seen by numerous birdwatchers near the Main OP. Picture below. January 2013: All 4 Spotted Eagles present. On 14th January I saw the adult bird in a tree c600m south of the Main OP. It flushed as I drove near it. According to satellite data Tonn is still present. The 1st/2nd winter bird has been seen recently. 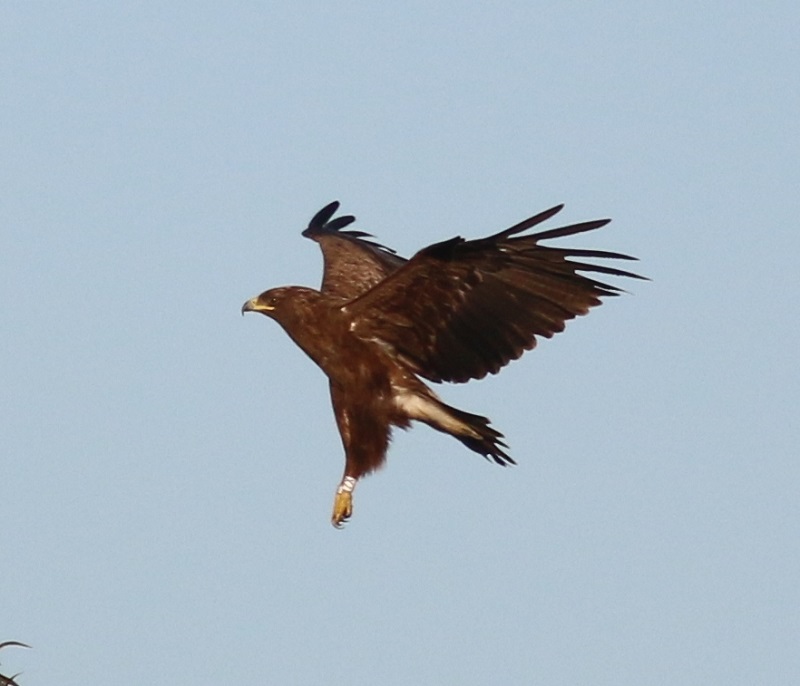 Not Tonn was seen twice hunting over Levante Marsh being attacked by Marsh Harriers and Booted Eagles on 16th. The adult bird was seen by numerous birdwatchers from the Main OP on 23rd. The adult was seen by 4 birdwatchers just off the Vistabella Rd just west of the South Gate on 29th. December 2012: 4 Spotted Eagles present. 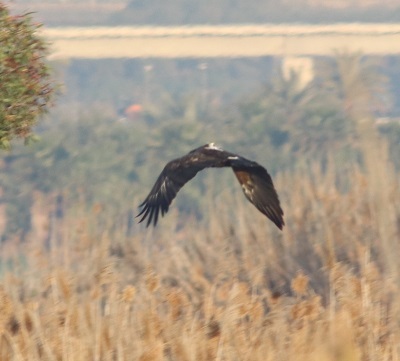 On 3nd December I saw the adult bird hunting over Poniente lagoon. 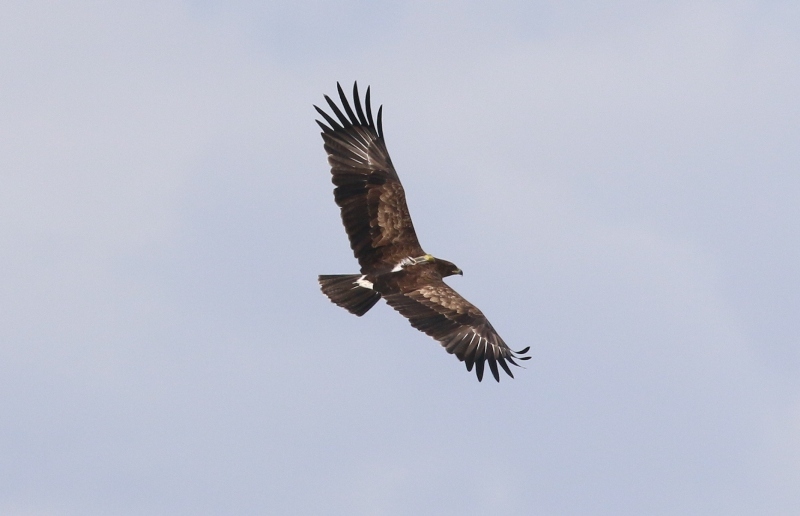 On 5th December many birders saw Tonn flying near the Main OP, often being attacked by Booted Eagles. On 14th December the adult bird was flushed from a eucalyptus tree c500m north of the South Gate. On 17th December I noticed 2 Buzzards continuously swooping into the trees just north of the Main OP. It was obvious that something large was within the trees but I couldn't see what it was. 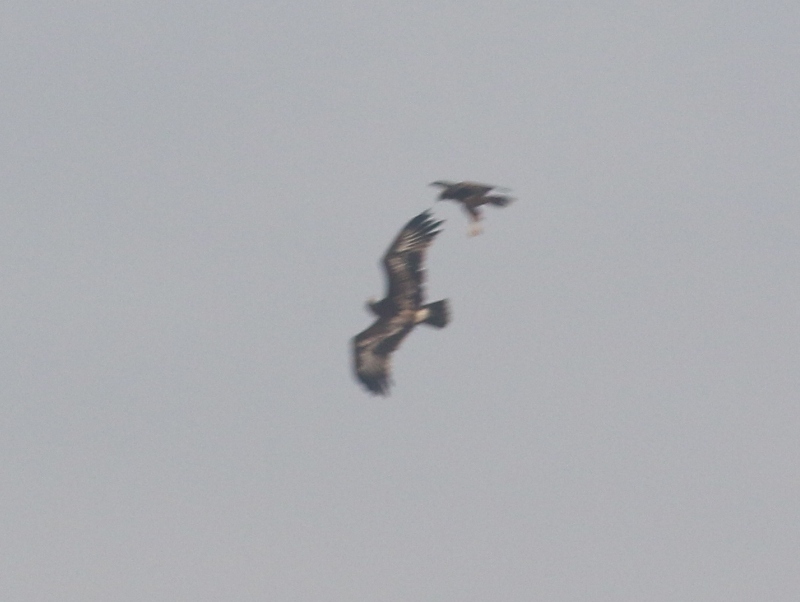 An Osprey then joined in the attack and eventually a Spotted Eagle came out. It was the adult bird. This bird was seen again from the Car Park near the Main OP on 19th again being mobbed by Booted Eagles and Buzzards. On 24th December I saw a juvenile bird c800m south of the Main OP. It was very spotted and was either a first or second year bird. A further 100m north Tonn also flushed out of the eucalyptus trees. Tonn seen on 5th December at Hondo from the Main OP. November 2012: 3 Spotted Eagles present. 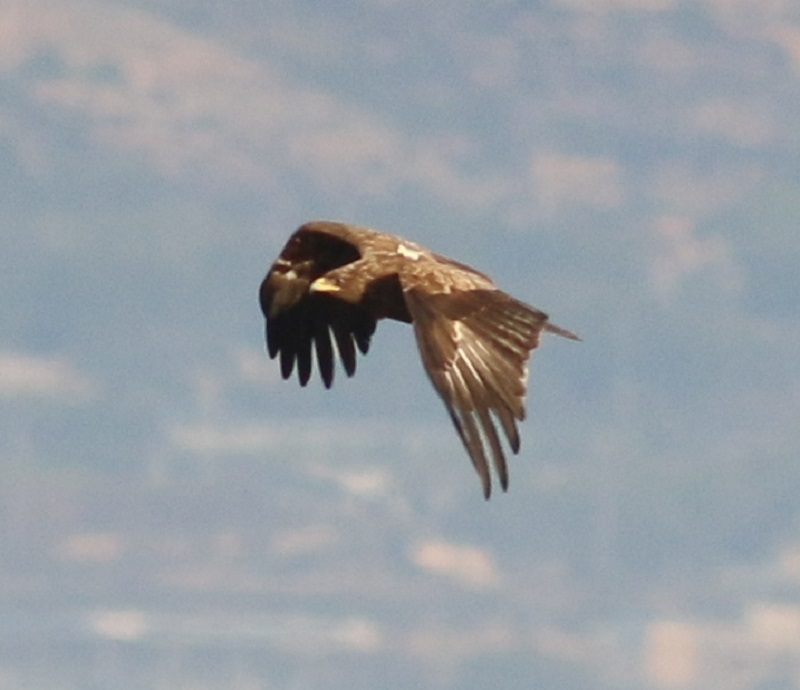 On 2nd November I saw the adult bird hunting over Poniente lagoon. On 9th November I saw Tonn from my car along the track between the South and North Gates. On 15th November whilst driving south from the Main OP I flushed a very large raptor from the track that had caught a snake or lizard. It clumsily flew down the track in front of me then veered off to the right. 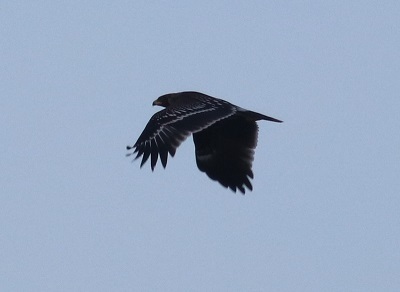 It was the adult Spotted Eagle. On 28th November the adult was seen in a tree just to the right of the track between the South and North Gates. It then flew off and was attacked by a Marsh Harrier and a Buzzard. On 29th November I flushed another Spotted Eagle from the eucalyptus trees c600m south of the Main OP. I managed to view it really well and got some pictures. Its plumage was exactly like Tonn (white 'V' at the base of the tail and some indistinct white marks on the upper wing) but without a satellite antenna. 'Not Tonn' is back!! However, as with last year, I have no idea whether this bird really is the same one as last year or the year before, but it is probably a fifth winter bird just like Tonn. Not Tonn seen on 29th November at Hondo being mobbed by a Marsh Harrier. October 2012: 2 Spotted Eagles arrive at Hondo. On 8th October both Tonn and an adult bird were seen at Hondo. This is the earliest record for this species in the 7 years I have been here. 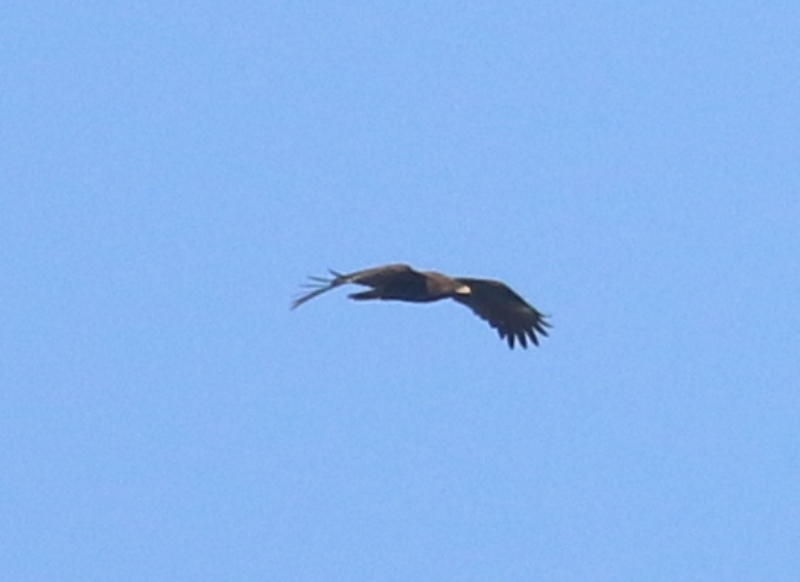 On 11th October the adult bird was seen being mobbed by 2 Booted Eagles near to the South Gate. On 13th October I flushed Tonn from the eucalyptus trees between the South and North gates. On 15th October I flushed a bird again from the eucalyptus trees. It flew over my car so I only saw the lower side. I wasn't sure whether it was Tonn or the adult. This is Tonn first seen on 8 October for his 5th winter at El Hondo. Note: He is still a sub-adult. 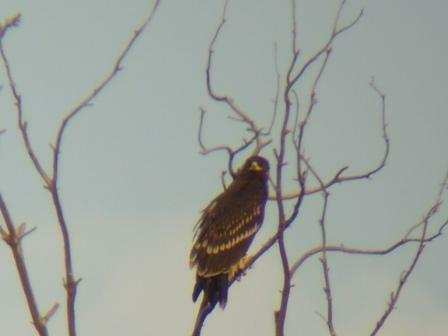 April 2012: All Spotted Eagles Have Now Left Hondo. 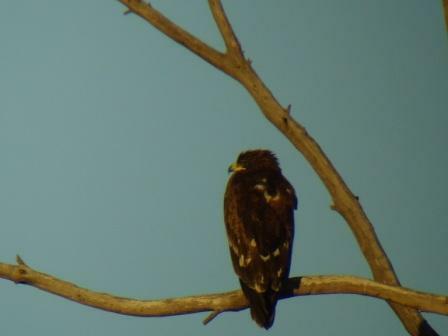 March 2012: Only 2 Spotted Eagles At Hondo Now. Tonn was seen between the South Gate and the Main OP twice on the 10th. Not Tonn was seen by at least 15 observers on the Main OP being mobbed by a Booted Eagle on the 10th. Not Tonn seen at the Visitor Centre on the 12th again being mobbed by 2 Booted Eagles. Not Tonn seen on the 14th on Poniente and on the 15th near the South Gate. Not Tonn seen on Poniente on 22nd. On the 24th, 1 of the 2 4th Winter birds was seen on the far side of Poniente at such a distance that it was impossible to see whether the bird had the satellite tag or not. On the 26th, Tonn was seen well from the Main OP on top of one of the eucalyptus trees. I took 2 photos then it flew. On the same day, Not Tonn was seen flying over the marshes from the Visitor Centre Boardwalk being mobbed by 3 Booted Eagles. Later that day, Tonn departed and is now on his way back to his summering grounds. February 2012: Still 4 Spotted Eagles At Hondo. There are still 4 birds at Hondo. Not Tonn seen well by 4 observers from the Main OP on the 1st. The adult bird was seen from the Visitor Centre boardwalk on the 3rd, over the Vistabella fields on the 14th and just inside the reserve near the South Gate on the 15th. Not Tonn flushed from his normal roosting palm tree on the 4th,5th and 8th. Tonn was seen on the 5th sitting on the top of a eucalyptus tree close to the Main OP. 3WB was seen by 4 observers from the Main OP on the 15th. Tonn, Not Tonn and 3WB all seen from the Main OP at different times of the morning on the 22nd. The Adult bird was flushed from the eucalyptus trees just south of the South OP on the 25th. 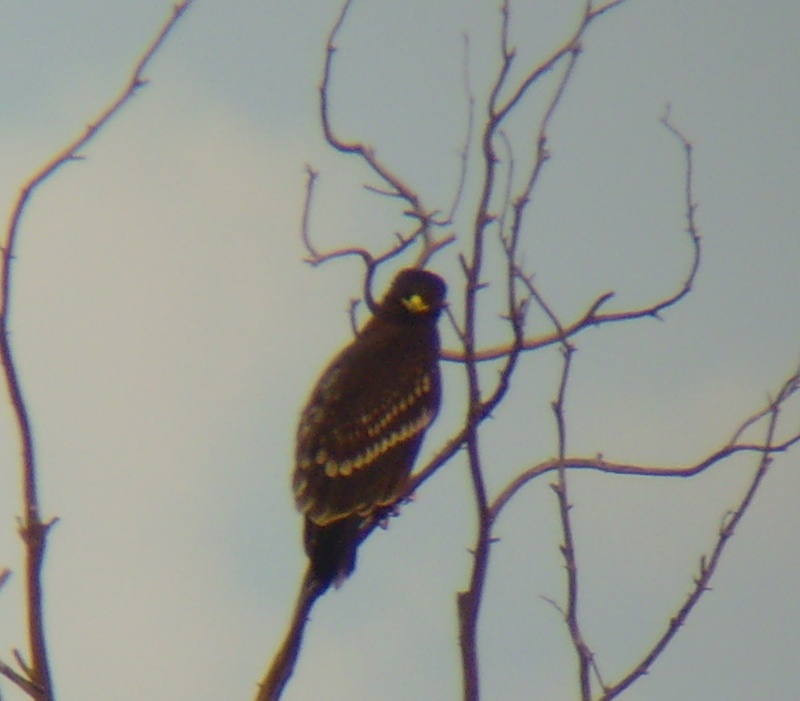 January 2012: 4 Spotted Eagles At Hondo now. Not Tonn was seen from the North Marsh Hide in shallow water at the north of Poniente Lagoon feeding on a Moorhen on the 2nd. After observing the bird for about 15 minutes, another bird appeared and came down, again, into the water and sat about 2 metres from Not Tonn. I could clearly see that this bird was an adult. Both Tonn and Not Tonn are still showing a white patch on the back	above the buffy coloured 'V' in the base of the tail, and this new bird did not have this patch, much the same as the Adult from last year. Not Tonn seemed to be nervous of this bird, and after a bit of a squabble, Not Tonn flew away, and the adult finished eating the Moorhen. Not Tonn was later observed sitting on the normal posts near to the Main OP. On return to the Main OP, 3WB was seen on a different post, quite near to where the other 2 birds had been seen. 3WB was seen again on a post on Poniente and hunting over the marsh from the North Marsh Hide on the 4th. Not Tonn seen on the 6th feeding on a Lapwing on the far side of Poniente Lagoon, from the North Marsh Hide. Tonn was seen in the palm plantation near the North Gate on the 16th. On the 18th, Not Tonn was seen back at the palm tree he was roosting in back in December. This is probably because the work that was going on inside the reserve has now been completed. The only disturbance now is at the South Gate area. A good day for the species on the 24th. On arrival at the car park by the Main OP, Not Tonn flushed out of the eucaluyptus trees and flew off. On climbing the Main OP I noticed a large bird in the eucalyptus trees about 200 metres from the OP. It was Tonn. A little later I noticed another Spotted Eagle on the post on the edge of Poniente where a number of observations have occurred. It was eating what looked like a small wader (Dunlin possibly). Later, it flew off and I saw it was the 3rd winter bird 3WB. On the 25th, Tonn was once again on the tree he had been on on the 24th. He was observed well for at least half an hour before flying off. Not Tonn seen a number of times at the end of the month near the Main OP. December 2011: 3 Spotted Eagles At Hondo now. Not Tonn was seen from the South Marsh Hide at the south of Poniente Lagoon on the 2nd flying repeatedly over a dead Flamingo. It was obviously trying to land on the bird to attempt to feed, but it seemed to be scared to land on it. In the end it flew off and landed in the eucalyptus trees by the path between the North and South Gates. Not Tonn also seen on the 5th,12th,13th,15th and 20th in his favourite palm tree just south of the South OP inside the reserve, on the 21st just north of there and on the 23rd on a post on Poniente. He usually flushes from the tree when anyone approaches within c150m. On the 15th, just after seeing Not Tonn at his normal position, a further 400 metres south another bird was flushed from another palm tree. It could not have been Not Tonn but looked exactly the same. It was almost certainly Tonn, but the satellite aerial was not seen. Tonn seen on the 23rd from the same position. 3WB seen 3 times on the 20th. Firstly on a post on Poniente c300m from the Main OP. Secondly at the same position about half an hour later and then about 400m further south in the eucalyptus trees. November 2011: 3 Spotted Eagles At Hondo now. Tonn has arrived at El Hondo on the 6th and seen again on the 7th,9th and 15th. The adult bird seen twice last month has not been seen this month so far. Another Spotted Eagle was seen on the 8th and 16th which was probably Tonn but I didn't see the Satellite Antenna as the bird was quite distant. On the 17th, a bird whose plumage was exactly the same as Tonn but did not have a satellite aerial was seen just south of the South OP in the reserve. This could be 'Not Tonn' from last year, but it is unknown. This bird will be called 'Not Tonn' from now on. It was seen at the same location on the 22nd and 25th. On the 30th 3 birds were seen all hunting over Poniente Lagoon. Firstly Tonn was seen by 3 observers. Then Not Tonn was seen on the ground eating something it had caught. A little later another bird was seen on a stick at the back of Poniente. This bird had quite a bit of white in the wings and back. It reminded me of Tonn and Not Tonn from last year which probably makes it a 3rd winter bird. From now on this bird will be referred to as '3WB'. October 2011: The first Spotted Eagle arrived at El Hondo on the 18th. 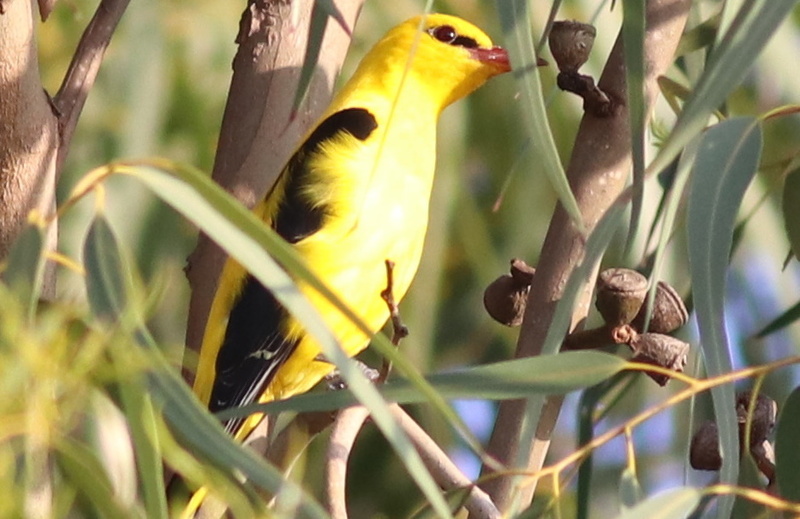 It was an adult bird briefly seen from inside the reserve. Probably the same bird was seen again on the 30th. Tonn was just north of the Pyrenees on the 30th and will hopefully be present soon. The picture above left is of Tonn taken 25th February in El Hondo. The picture above right is of Tonn taken on 5th March. Note the supposed colour changes. These are the same bird!! These 6 pictures are all Tonn, the first one from winter 2009/10 and the next three are from winter 2010/11. The fifth is of Tonn taken on the 18th November 2010 and the last is from 14 December 2010. Note the difference in plumage from 2nd winter to 3rd. These 2 pictures are of a juvenile Spotted Eagle. They look similar to Tonn as a 2nd year bird.